Once again we are at the beginning of a new year. Let us commit ourselves to a mission, setting a goal to combat global warming. 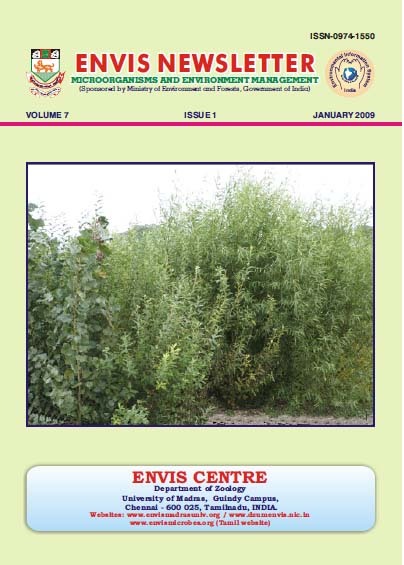 To assist you further in this, the ENVIS team has put together informative articles on microbes, their ability to generate fuel, phytoextraction of chromium using plant and sepentine soils, a unique ecosystem in Andaman, a source of microbes for metal biosensor. Our team continues to work closely with the need of user community including updating the website, establishing a network of users and coordinating activities on the assigned thematic area. You may reach us at www.envismadrasuniv.org/send_feedback.php with your feedback or inputs. Please be assured that your suggestions are invaluable and we welcome them wholeheartedly. Wishing you a Happy & Bountiful New Year, 2009.